The aircraft rental process involves a checkout flight with one of our instructors, signing the Renter's Agreement, providing proof of rental or non-owned aircraft insurance, and completing the aircraft checkout sheet. Much of this can be completed prior to arriving for your checkout flight. Choose your location, then view the Aircraft to select a preferred airplane. The W&B and POH are listed on the individual aircraft's page. Visit our Documents webpage for Renter's Agreement, Aircraft Manuals, Avionics Manuals, Checklists and other useful documents. 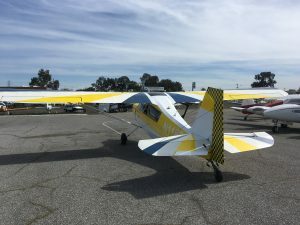 AeroDynamic requires all solo students and renters to have their own insurance policy for at least $20,000 liability, physical and property coverage to provide protection for the pilot. Many insurance companies offer a Rental/Non-owned policy. We recommend Avemco, Aviation Marine, and AOPA. Visit their websites to learn more or call our office for advice. RENTERS: Flying rented aircraft? Avemco Insurance Company has coverage designed to protect you. OWNERS: Own an airplane or planning to buy one? Avemco Insurance Company has coverage designed to protect you, your family and your airplane. If you have your own airplane insurance policy, or if you are on someone else's policy, you are often coverage by the "Non-owned" portion of that policy. Email a copy of the policy to info@aerodynamicaviation.com once you have it or if you have any questions about it being sufficient. For any policy, you'll want at least $20,000 minimum liability. NO FUEL SURCHARGES, WHAT YOU SEE IS WHAT YOU PAY! Fuel purchased at a location other than aircraft's base will be reimbursed up to the cost of fuel at it's normal location. Minimum 24 hours cancellation notice is required or you may be charged for the missed rental and instructor time. Thank you for supporting us. We aim to stay very competitive, and we look forward to continuing to see you fly with AeroDynamic Aviation. BLOCK PRICING: Block rates are only available at Reid-Hillview and only to members in good standing. Membership is $50 per month or $350 per year. Members who maintain a positive balance on their account will earn 10% credit for check or cash payments (7% for credit cards) of $500 or more. Block prices assume 10% credit has been earned. Block pricing applies to aircraft and instructor rates only and cannot be combined with any other offer. All rentals are subject to the latest AeroDynamic Aviation / Amelia Reid Aviation, LLC, Renter’s Agreement. Negative accounts must be paid in full before block rate will be applied. Block payments are not refundable. Prices and rates are subject to change without notice. All training and rentals are subject to the terms and conditions in the Renter's Agreement. Minimum 24 hours' notice required for cancellation or you may be charged for the rental time.